Bunny Carr, who passed away on Wednesday 19th September, with his wife Joan were very enthusiastic and active Sutton Dinghy Club sailors in the 1950s, until Joan contracted polio in the early 1960s. They owned an International Twelve Foot dinghy, the type of dinghy which features on the Club burgee. The pair can be seen in their sailing gear, a era before wetsuits and cags. Note Bunny’s ever-present pipe – he was a master at giving himself time to weigh up the pros and cons of any situation, taking time to stoke and draw on the pipe before deciding on the best course of action – we don’t know if he had time to use this technique when approaching a gybe mark! 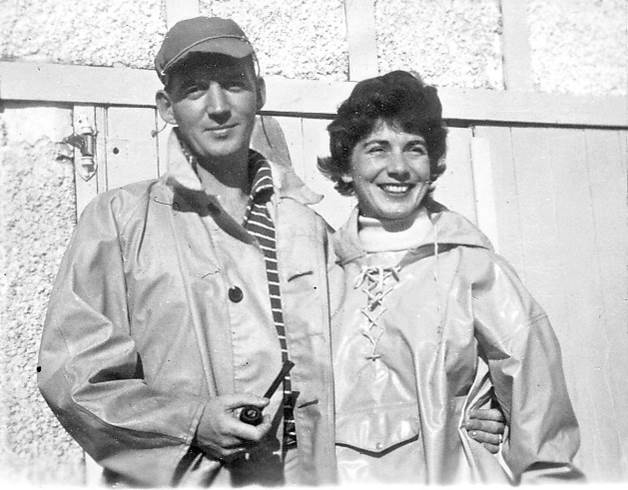 Bunny Carr was born in Dublin in 1927 and grew up in Clontarf, moving to Sutton with Joan in the 1950s, where they raised their three children Carolyn, Alan and Philo in their house off Strand Road, and took great advantage of the short walk to the Dinghy Club. The second photos shows Bunny preparing the clinker hull for racing with a very young Alan. Anyone looking at the finish on Alan’s 56-year-old IDRA14 “Starfish” will see that those lessons were not forgotten. The sailing gene continued down the generations, Alan a multiple IDRA14 National Champions and grandson Davie, Captain of the Trinity College Sailing team. 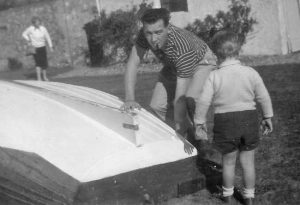 In recent years Bunny was still helping Sutton Dinghy Club host national events, by providing camping facilities for visiting sailors in his garden. 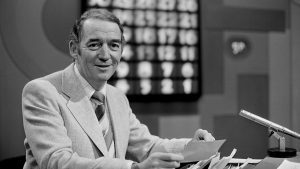 A former bank clerk, ever the entertainer and with great community spirit, Bunny first displayed his quiz-master skills hosting Sutton inter-school competitions between Santa Sabina and St. Fintan’s, before becoming a nationwide personality on the Telefis Eireann “Stop the Lights” Quicksilver TV quiz show. Along with Quicksilver and Going Strong, his other television shows for RTÉ included The Life Game, The Politicians, The Person in Question and Encounter. In 1970 he went to work as Director of the Catholic Communications Centre, where he trained priests in media skills. In 1973 he left to set up his own PR firm, Carr Communications. Bunny Carr left RTÉ in 1984, but made occasional appearances on Irish television. He remained with Carr Communications until his retirement in 2004. Pre-deceased by his wife Joan in 2005, he is survived by his daughters Carolyn and Philo and son Alan and their families. The Committee and members of Sutton Dinghy Club extend their condolences to the Carr family as they mourn the passing of a true gentleman.